War is the last tool of diplomacy so why is it used so often? Time and again, it is for the wrong reasons, the wrong resources, the wrong people and often fought in the wrong place. The top element is a straight bar with chevron cuts, signifying the rigid and unwavering path leaders tend to follow into conflict. The primary element of my piece is an olive branch, an offer to end the hostilities which might have been avoided in the first place. Yet, at the bottom of it all is the idea that there is always too little, applied too late. Too little time spent discovering the reasons, too little time finding ways around the conflict, too late to turn from the path without losing face, something that you lose by the end of it anyway. I have placed two symbols of peace on the medal, one to reign in the rigid thinking that leads only down the straight path to conflict, and one for the primary purpose of finding the way to grow through the differences and find the common ground that we all need. This work was done for the October, '07 show at the Thomas Mann Gallery in New Orleans, LA "Anti War Medals", an invitational show. 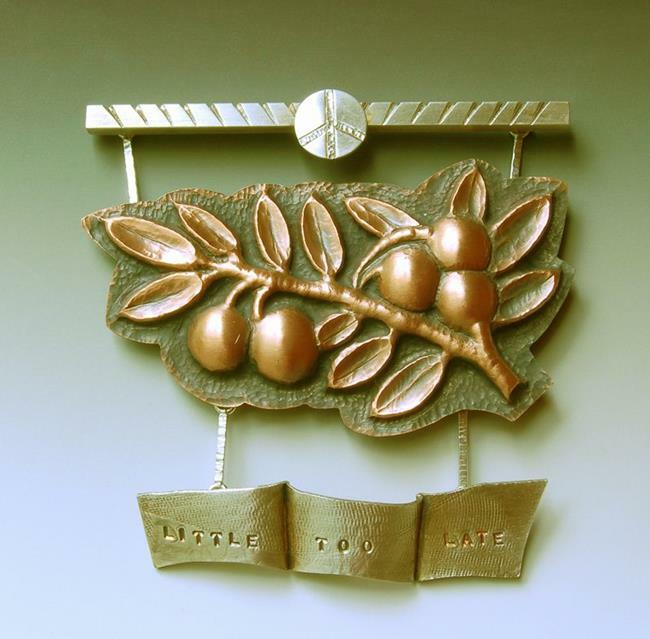 The main body of the piece is an olive branch done in repousse, a method of manipulating a thin sheet of metal into a three dimensional form using a pitch bowl and various punches. The bottom section is fol formed and roller printed.